Battle of La Rochelle (1372), a Castillian fleet annihilate the English fleet at the early stages of the Hundred Years’ War by Giuseppe Rava. King Charles’s reconquest had continued. Although the Mayor of Poitiers supported the English, its people opened the gates to du Guesclin in 1372 and the rest of Poitou soon followed its capital. In June the same year, off La Rochelle, a Castilian fleet defeated an English fleet under the Earl of Pembroke—the new Governor of Aquitaine—sending the ship carrying his troops’ pay to the bottom and taking the Earl back to Spain as a prisoner. In consequence the Mayor of La Rochelle overpowered the English garrison and admitted du Guesclin. The Constable also took Usson in the Auvergne, while the whole of the Angoumois and the Saintonge went over to the French. There were not enough English troops to provide adequate garrisons and the enemy seemed to be everywhere. The English strongholds in Normandy and Brittany were falling and even Guernsey was invaded by a French force under Evan of Wales (a member of the former ruling family of Gwynedd). The development of battle tactics are also clearly illustrated in the course of this encounter, which took place in June 1372 at a time when England’s military prowess was on the wane. Edward III was now old and had lost his wife, Philippa, probably to a recurrence of the plague in 1369. Both 1370 and 1371 had seen invasion scares, with the south-coast towns on alert for raiders, and stories circulating widely of large French fleets being gathered for a descent on the English coast. John of Gaunt was actively pursuing his ambitions in Spain and attempting to put together an expedition and a fleet for that purpose. In France itself, English forces in the southwest were under pressure. In these rather unpromising circumstances the young Earl of Pembroke was commissioned in April as royal lieutenant in Aquitaine. He finally left to take up his position in June, leading a small force of probably under twenty ships, mostly small transports, but with three large vessels as escorts. He had with him 224 knights, fifty-five esquires and eighty archers. He also received a large sum of money in gold and silver, about £12,000, so that he could recruit and pay an army of about three thousand men when he reached his destination. The various chronicle accounts then differ markedly as to what then ensued. Froissart as usual has a stirring tale to tell, which also changed between the different versions of his work. The foremost English chronicles hardly mention the incident. The Anonimalle Chronicle merely states that ‘the young count set out towards Gascony with too few men to the great damage of England’. He encountered enemy ships and was captured along with some of his companions and others were killed.38 A French chronicle, the Chronique des Quatre Premiers Valois, explains that on 22 June the English squadron arrived off La Rochelle and found a force of Castilian galleys already barring their way. The English thought little of the Spanish and were not unduly disturbed. 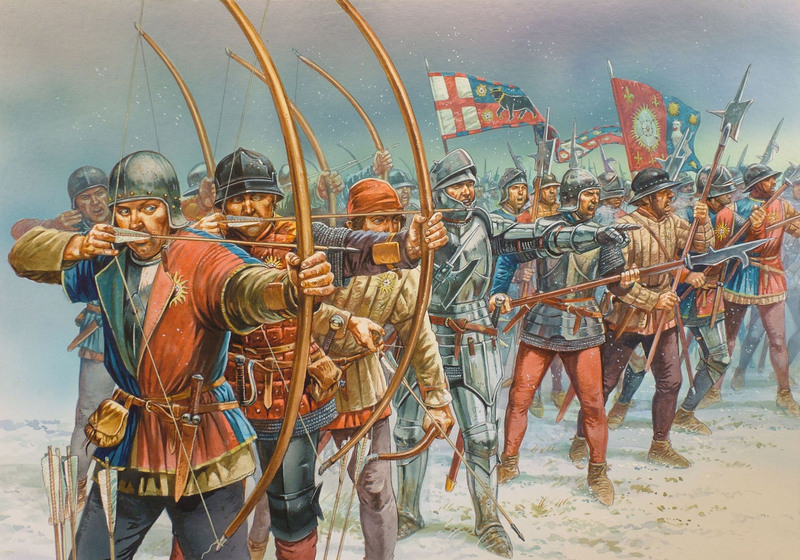 An action ensued with the crossbowmen on the galleys opposing the archers on the English sailing ships. At nightfall this was still inconclusive so the two fleets parted. The chronicle also implies at this point that low tide was around dusk, perhaps around 9pm. This chronicle is then adamant that at dawn the next day after the first attack the English were aground because of the falling tide. The galleys, drawing much less water, were still able to manoeuvre freely and attacked, this time using flaming arrows and pots of grease and oil to set the English ships on fire. Soon most of the English ships were alight, with terrified horses in the holds adding to the confusion and uproar. The earl’s vessel was grappled by no fewer than four galleys and despite fierce fighting on the deck those who remained alive were forced to surrender and were captured. The treasure intended to pay the army in Gascony also fell into enemy hands. This account of the battle has generally been accepted, although there is some disagreement over whether the English ships went aground. The timing of the crucial tide changes must remain uncertain without precise information but it seems likely that the tide was ebbing from around 2–3am on the morning of 23 June so that at dawn when the Castilian attack went in this would soon be a problem for the English ships if they had anchored not far from the shore. More controversial is the effect of this battle. One historian has called it ‘the greatest defeat ever sustained by the English navy’. Another has claimed that the effect was, ‘to stimulate naval activity’. The most recent writer’s view is that ‘the loss of prestige incurred by this first major English defeat was incalculable.’ For most contemporary English chroniclers the most important matter was the capture of the Earl of Pembroke by the Spanish. Despite the loss of ships in this disaster and the need to compensate the owners of three of the largest with grants of royal ships, a large fleet was raised later that same summer for an expedition to France, which came to nothing because of a long spell of adverse winds. There is also evidence that the fact that a galley fleet had destroyed one made up of sailing vessels lay behind the decision to set in train the building of more balingers and barges for the Crown. Feelers were also put out to both Genoa and Portugal in the hope that they might be able to provide galleys or oarsmen to power the new balingers. More generally, English military power was receding as Charles V of France reinvigorated his forces both on land and at sea; the era of English success and stunning victories seemed to have ended, as the enormous expense of the wars became more and more apparent to a people who had lost much of their enthusiasm for the whole endeavour. The idea that all ships in the possession of Englishmen and able to go to sea made up the navy of England was deeply rooted in the minds of English monarchs and accepted by English seafarers. However reluctant they might be at times to obey a royal summons to serve the King and defend the realm with their vessels at sea, the existence of this principle was not questioned. English kings from at least the tenth century had at times also owned ships themselves and had used these in a variety of roles. The twists and turns of external circumstances and royal policy ensured that there was little continuity in the royal ownership of ships, or in the way they were financed or maintained. We have seen that some English kings devoted considerable time and energy to the well-being and the proper use of their ships, while others neglected them, or in fact disposed of them entirely. How did the rulers of other states approach the same problem of defending the dwellers on their coasts, their ports and their trade? How did they also attempt to supply the need for ships that could give a good account of themselves in war at sea? Facing the North Sea and the Atlantic, the kingdom of France possessed, in theory, around 2500 kilometres of coastline, stretching from the estuary of the Zwyn in Flanders to Hendaye on the frontier with Castile. At the beginning of the thirteenth century, however, only the counties of Ponthieu and Artois on the north coast were ruled directly by the French king; other territories including Flanders, Normandy, Brittany, Poitou and Gascony were fiefs of the French Crown, but were ruled directly by dukes or counts who often followed their own policies. This was particularly the case with the territories which were ruled by the Kings of England as dukes, first of Normandy from the Conquest till c.1204 and from c.1417 to c.1450, and second of Gascony (also known as Aquitaine) from 1152, when the future Henry II of England married Eleanor of Aquitaine, till 1453. Brittany, under its own duke, also pursued independent policies until the last years of the fifteenth century, when the French king took over the direct rule of the duchy by marrying Anne, the heiress of the last duke in 1491. As a consequence of this situation, kings of France had taken little interest in maritime matters, until the collapse of English rule in northern France in the reign of King John extended their power over most of the Channel coast. The kings of France, initially Philip II Augustus, now had control over a coastline in the north of their kingdom with excellent ports, where maritime trade was on the rise, and where skilled and adventurous seamen could be found in large numbers. They also had the power to demand feudal service at sea from these mariners and their ships in much the same way as the English Crown could rely on its power to conscript ships and crews for royal fleets. As Michel Mollat put it, ‘Philip [II] did not have a fleet but he had ships’. It was a fleet raised in this manner which met with the English at the battle of Dover in 1217. There are not, however, many surviving French equivalents of the letters patent, commissions and accounts which allow historians to examine in detail the fleets largely made up of conscripted merchant ships raised by English kings from the thirteenth century onwards. It is easier to find evidence of the measures taken by French kings to defend their coastline by fortifying ports and building castles, for example at Montreuilsur-Mer and Boulogne. After their control also extended by the mid thirteenth century to the coast of Poitou and Saintonge, the fortifications of the major port of La Rochelle were also strengthened, although it was not until 1345–47 that the twin towers which guard the harbour entrance were built. These still exist and the Tour St Nicholas, in particular, is a very imposing structure; the watch tower is more than 35m above sea level. A chain was stretched across the entrance to the harbour between the two towers on which cannon were also mounted. Harfleur had similar towers, while at Honfleur across the estuary of the Seine one tower was built by the French in the mid fourteenth century, and another built c.1430 when the town was ruled by the English.